Hello again! I've been busy lately with back to school and traveling and a bunch of other stuff so I haven't been blogging. I've still been reading though and I'll be catching up with reviews in the next week or so. Anyway, I wanted to pop in now to invite all of you to a read-along and give you time to pick up the book in the next week. 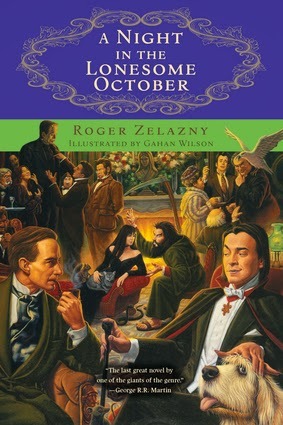 It’s now two weeks until October 1, and that means one thing: it’s time to reignite the beloved October tradition Roger Zelazny fans have been celebrating for the past two decades. Please join Chicago Review Press in celebrating one of the greatest science fiction writers of the 20th century for our first annual A Night in the Lonesome October Read-A-Long. The book is being re-issued by Chicago Review Press for October 2014. What better way to re-introduce readers to this spectacular dark comedy or those unfamiliar with Zelazny’s work than with a month-long celebration of the book? The book, which is split into 31 chapters, is a mix of humor, horror, mystery, and fantasy. It’s considered by many (from Kirkus to George R. R. Martin) to be Zelazny’s best novel, and there is a tradition among its fans to read the book, one chapter a day, each day in October. Starting Wednesday, Oct. 1, we’ll have a weekly meet up, where we’ll chronicle our read-along via Chicago Review Press’s social media (@Chireviewpress) and the hashtag #gooddogsnuff. We’d love for you to follow along, or post your own thoughts on the book (If you’re not familiar with the book, it’s narrated by Jack the Ripper’s loyal dog, Snuff). 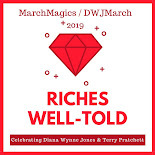 The 31 chapters of this book are very short so this is a commitment of only a couple of minutes a day through the month of October (and if you fell behind, catching up would be easy). You could also add a read of the Neil Gaiman short story "Only the End of the World Again", inspired by Zelazny's tale. I would do that but I happen to have just read it this summer. How was that for blind foresight? So, how about it? Is anyone up for a "humor, horror, mystery, and fantasy" read in October? The main reason I decided to join up is that I've also never read any Zelazny but I see his name pop up all of the time. This was the perfect time (and I think book) to jump in with! Indeed! I've just reserved it at the library. Now I have to make it there before October 1. Yay! I hope you find a copy because I think it's going to be a crazy and fun read!